At 7.28am, following seven days of bombardment by the British artillery, the Lochnagar mine was detonated underneath the German lines and eight successive waves of infantrymen of the 34th Division stood up from their trenches, and in straight lines prescribed, officers in front as ordered, set off at a walk to attack the German front line trenches. This was to be the bloodiest day in British military history. The road from Albert to Bapaume runs directly to the northeast. Topping a rise before descending into the Avoca Valley, it then starts its long steady climb past La Boisselle, close on the right, to the summit of the ridge at Pozières, nearly halfway to Bapaume its destination. La Boisselle itself is on a small spur which reaches out into the valley. It was on this front that the 34th Division, as part of the III. Corps under the command of Lieut. General Sir W. P. Pulteney, was to advance on July 1st 1916, the opening of the British infantry assault of the Battle of the Somme. On the front of the 34th Division two large and two small mines were ready to remove the heavily fortified German strong points which might be left in the enemy’s front line after the previous seven day bombardment by the British artillery. Major General E.C. Ingouville Williams, who commanded the 34th Division, was confident that his men could thrust up Mash Valley to the left and, Sausage Valley to the right of La Boisselle, outflanking the village and driving what remained of the German Garrison into the guns of his troops manning the trenches at the south west entrance of the village. While the rest of his division would continue in their advance to Pozières and Contalmaison throughout the rest of the day. An Aerial view of the Somme battlefield in July 1916 taken from a British observation kite-balloon. 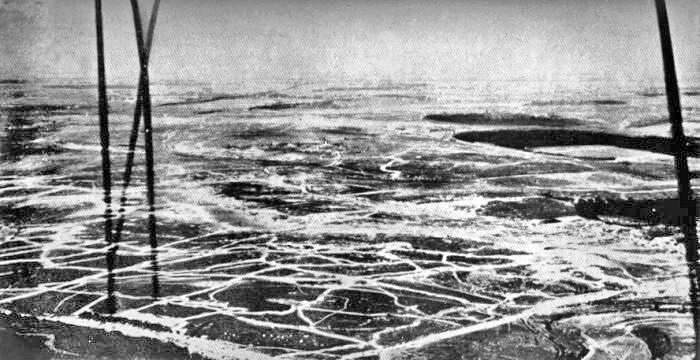 The balloon was tethered near Bécourt, between La Boisselle and Fricourt, and the view is northeast towards Bapaume. The dark areas on the right of the photo are, from bottom to top, the woods of Fricourt, Mametz and Bazentin. The British front line is at the bottom foreground. The German front line is the blurred line across the centre of the photo, having been subjected to the prolonged British artillery bombardment. The Roman road from Albert to Bapaume is just visible running diagonally across the top-left of the photo. In the front line, astride the road, was the 102nd (Tyneside Scottish) Brigade, with the 20th and 23rd N.F. (1st and 4th Tyneside Scottish) to the left and 21st and 23rd N.F. (2nd and 3rd Tyneside Scottish) to the right, alongside 101st Brigade, with its battalions, the 10th Lincolns (Grimsby Chums), the 11th Suffolks (Cambridge Pals) and 15th and 16th Royal Scots, on the right of the Divisional line. In support, on the Usna and Tara ridges a mile to the rear, was the 103rd (Tyneside Irish) Brigade, composed of the 24th, 25th, 26th and the 27th Battalions (1st – 2nd – 3rd – 4th Tyneside Irish), Northumberland Fusiliers. 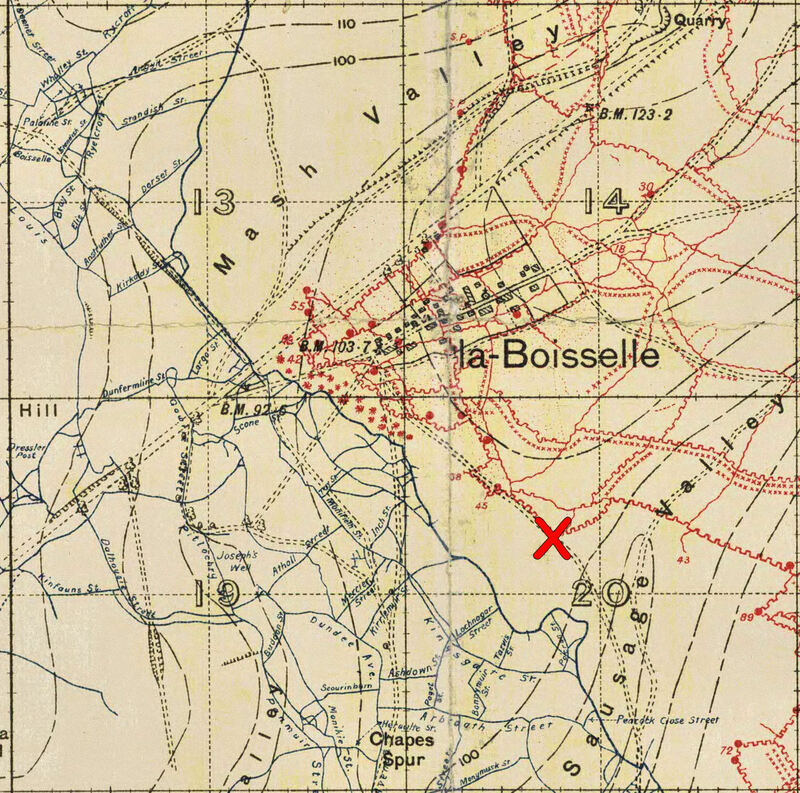 Half a mile to the south of the village of La Boisselle, at 7.28am, a mine was blown that overshadowed the seven large and eleven small mines by both its size and achievement. Twin charges, of 36,000 lbs (16,300 kilograms) and 24,000 lbs (10,886 kilograms) of ammonal, had been placed in two chambers at 60 feet (18 metres) apart. Captain James Young of the 179th Tunnelling Company. Royal Engineers, pressed the switches and observed that the firing had been successful. 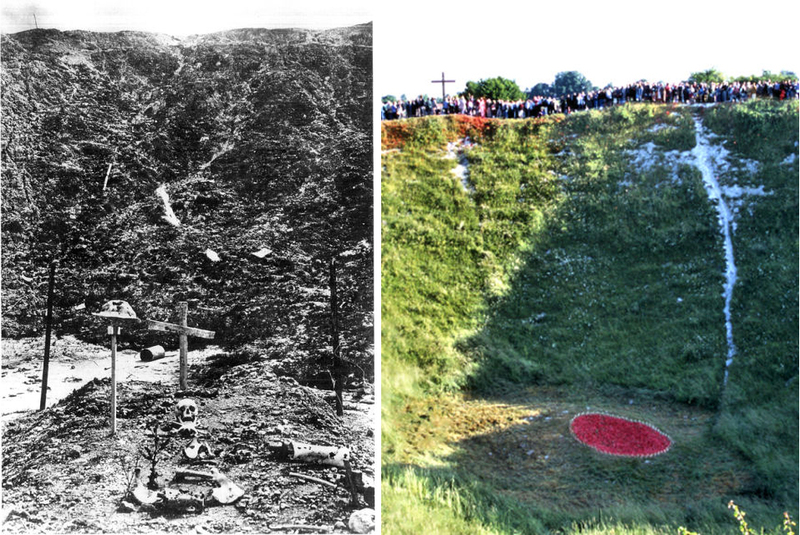 Captain Young had blown the mine crater of La Boisselle, the biggest of the Great War, a single, vast, smooth sided, flat bottom chasm measuring some 220 feet (67 metres) diameter excluding the lip, and 450 feet (137 metres) across the full extent of the lip. It had obliterated between 300 and 400 feet (91 and 122 metres) of the German dug-outs, all said to have been full of German troops. 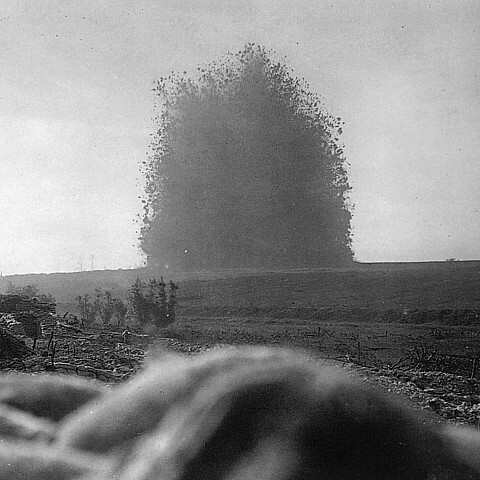 Explosion of the mine beneath Hawthorn Redoubt. In eight successive waves the infantrymen of the 34th Division stood up from their trenches, and in straight lines prescribed, officers in front as ordered, set off at a walk to attack the German front line trenches. One mile behind the British front line the four battalions of the Tyneside Irish Brigade climbed from their trenches, on the Usna and Tara ridges, and started down the hillside. In a matter of minutes this Brigade had sustained heavy casualties from enfilading machine gun fire. 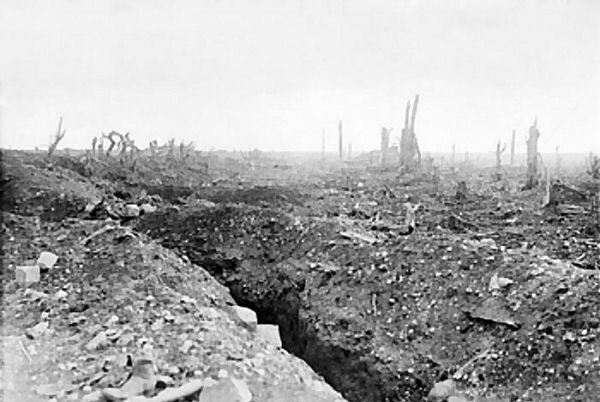 The badly shelled main road to Bapaume through Pozières, showing a communication trench and broken trees. During the intensive bombardment of the previous days the Germans had sheltered in their deep bunkers, tormented by the incessant concussions as they were battered by the British artillery fire. But they had survived and so had most of their barbed wire. The silence of the barrage lifting was the signal for them to come up from their deep dugouts, hauling their machine guns with them, and taking their positions in the line. Through the smoke and the haze of gunfire the German defenders peered out on an astounding site, successive waves of British soldiers marching steadily toward them as if on parade. The enemy were offering themselves as perfect targets. 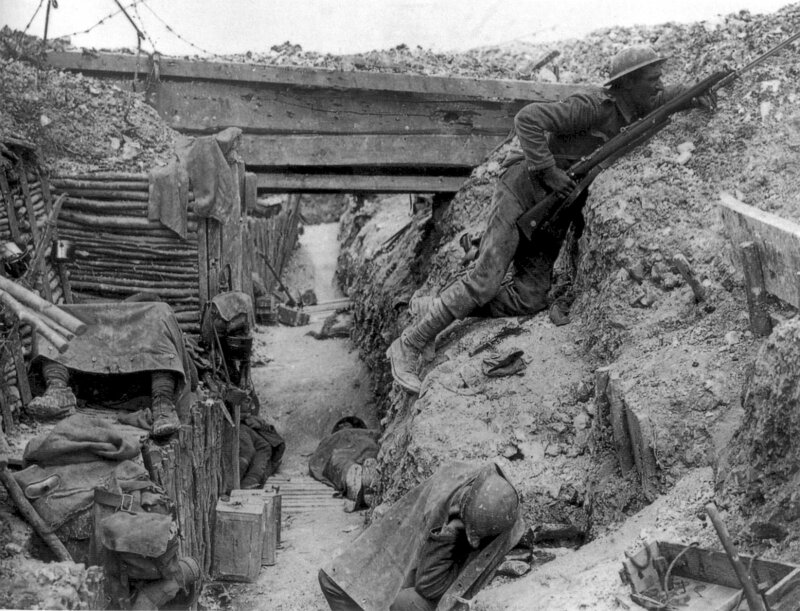 The slaughter was immense, the machine guns cut down the British infantry like a farmer’s scythe cuts hay. Within minutes German artillery was raining down on the attacking survivors, the regimental rows of British soldiers had disappeared. Parade ground order was now forgotten, small groups of survivors continued forward taking cover in shell holes. Some of the survivors gained the sanctuary of the Lochnagar Crater, and by the early evening were able to make contact with elements of the 21st and 22nd northumberland Fusiliers, who held a position in the German second line between Lochnagar Crater and the village of La Boisselle. On the right of the Divisional attack small parties of the 15th and 16th Royal Scots and elements of the 11th Suffolks and 10th Lincolns were to advance 700 yards into the German lines and occupy a position in Wood Alley which guarded the left flank of the advance of the British 21st Division. From information obtained later, and those present at the taking of Contalmaison, it is amply proved that men of the Tyneside Irish Brigade did actually reach this village on the 1st July, but none lived to tell the tale. The two photos were taken about 90 years apart.